August 11, biking up Pape Ave to the studio when WHOA! there in the corner of the street, urban carnage right before me! 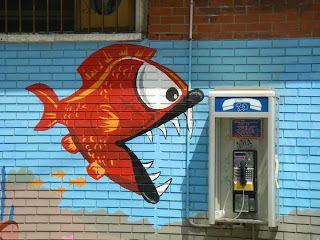 one of the last remaining phone booths in the city being savagely attacked and devoured by the dreaded Urban Piranha! run! flee! swim for your life!